The slow cooker was made for soups. I cook these 7 Vegan Slow Cooker Soups all winter and I think you’ll enjoy them too. 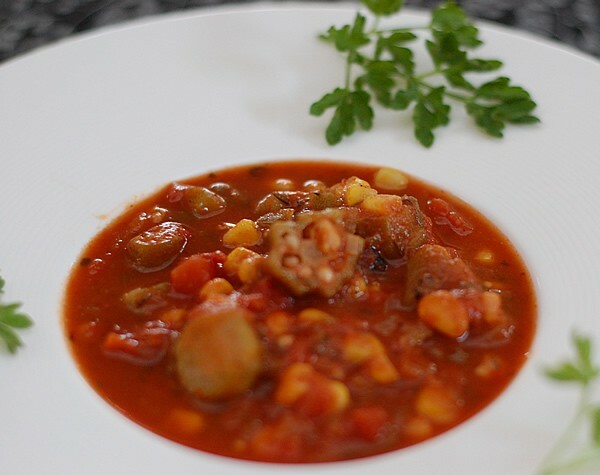 If you just got a new crockpot for the holidays, a soup is one of the best recipes to use for your test run, because you’ll have less problems if it runs hot because of the amount of liquid that’s already in the recipes. What’s your favorite winter soup? Do you make it in your slow cooker? 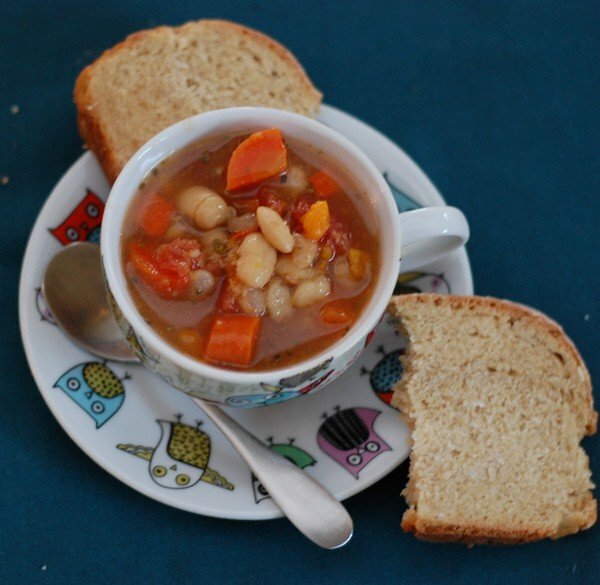 Super Easy Slow Cooker White Bean Veggie Soup uses 4 or 5-quart slow cooker, but should work in a 6 quart too. It also uses dried beans – making it budget-friendly too. Farro and Split Pea Soup makes about 4 servings in a 4 quart slow cooker. You don’t need to have specialty farro and could even use barley or millet in its place. Granted, this soup doesn’t look like much. Even the ingredients are simple in this Asian Corn Cabbage Soup. This is one case where the ‘whole’ is more than its parts. This is a must try! 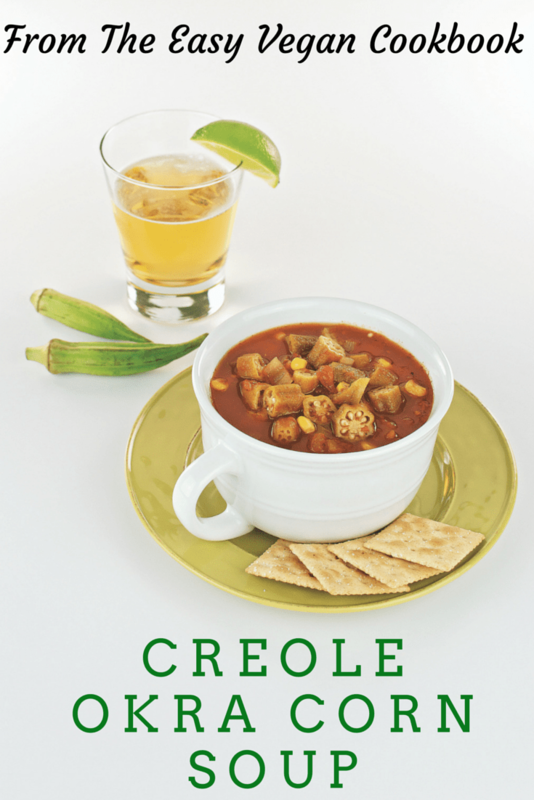 Creole Corn and Okra Soup is a bowl of warmth and comfort. It’s great after a long day at work and keeps well in your slow cooker if you end up in one of those meetings that last forever. Feeling a little under the weather? This Get Well Quick Chickpea Soup is just the thing you need. It uses Kamut but will work with wheat berries, barley, oat groats, even millet, if that’s what you have on hand. Keep a few servings in the freezer so you’ll be prepared for a cold later on. 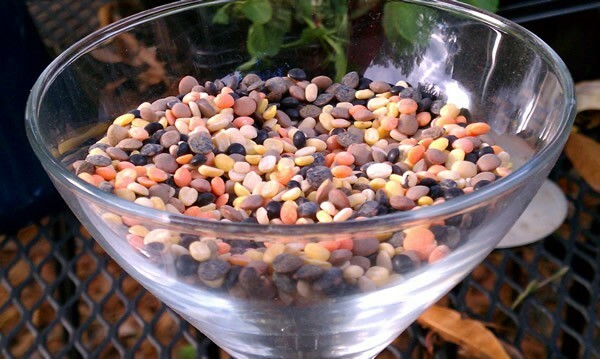 This is a basic lentil soup recipe. I used a fancy mix of lentils, but it’s still a brown soup in the end, so you can use what you have in your pantry right now. Want to make just enough soup for two? 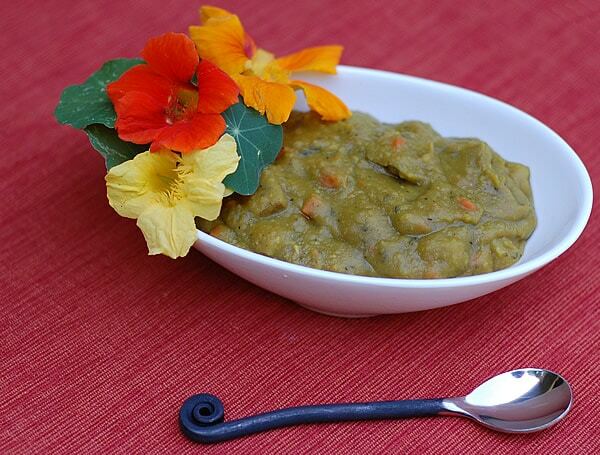 This thicker than fog split pea soup cooks up in your 1 1/2 to 2 quart slow cooker. Remember that you can cut the other recipes in half to modify them for your smaller slow cooker. Alternatively, you can double this one to serve a larger family. 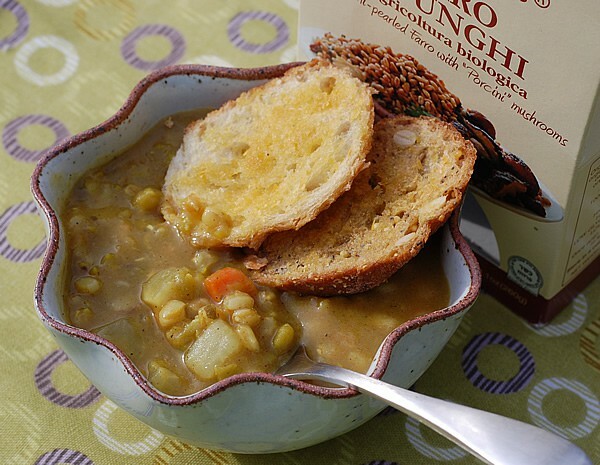 What’s your go-to soup? Do you have one that you like to eat when you don’t feel good? I would like some ideas for popcorn. I love popcorn, but since going fat free Vegan, have not been able to find a good way to season it. I don’t care for the savory, like aminos or worcestershire sauce. 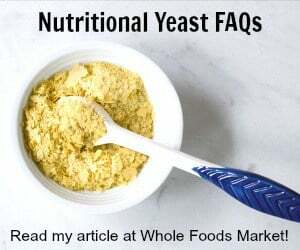 I just miss butter and can’t find a way to make nutritional yeast stick to the popcorn without making the popcorn soggy. Any ideas? I will have to think about an oil-free way and get back with you. It’s funny because I really just thought I should come up with some popcorn recipes for the blog! I’ve seen Tabasco (with salt) in a spray mist bottle used on popcorn while hot with tasty, crisp results. I imagine anything that requires a rather small amount for flavor would work. 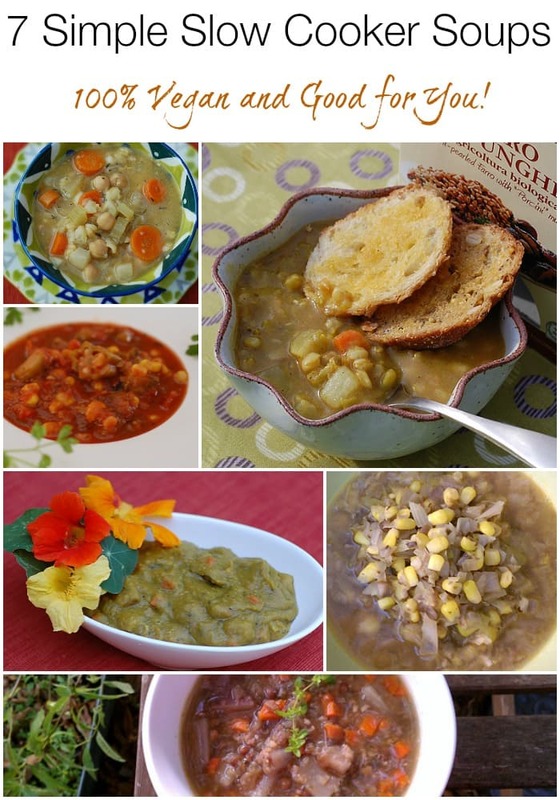 What book are all these great looking soups in? I would love to by it! Your Vegan Slow Cooker cookbook is one of the most used cookbooks I own! As a matter of fact, right now my slow cooker has your Split Pea & Lentil Soup in it. We also love the one with apple and coriander. The first chapter of this book is so amazing, opening up so many possibilities for using a slow cooker. I recommend this book to every vegan I know! I’m not vegan but these soup feel comfort me! I will try them, for sure. PS. My favorite soup is simple stone soup of my mom.